They just go on an on. Until they go off. That’s a fuse? Good luck with that. There. I proved it. The lighting exists. 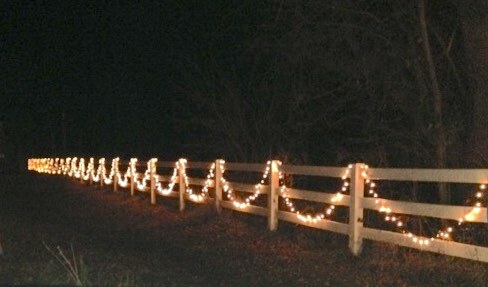 I swagged lights across the front of the small pasture by the road, and they all worked. All fourteen strands of them. For years, Then, this year, the lighting scheme defied me. It kept blowing the first strand and they'd all go out. The definition of insanity was invoked. I replaced the first strand again and again. Pow. So I bought all new lights. This after installing those tiny fuses into the blown strand only to have it go out again. Have you ever tried to mess with those little fuses? All new lights shone satisfactorily and I turned around to walk back inside. I paused to savor the lights one more time before I shut the door. No lights. Darkness taunted me. It has become a...thing. Freddie likes to see them when she drives home at night. A beacon of warmth and Christmas cheer to greet her after the long drive. It's the least I can do for the woman who supports my writing and sculpture habits. The last few nights, no lights. This is unacceptable. I shorten the string daily, taking the farthest string and replacing the first blown string. Sure, the box says three strings only. But for years I've strung together fourteen of them with no problem. Now it's as if they're daring me to just try that again. Double dare. The double dog dare even, and I have taken them up on it. I have stepped up, put my tongue on the frozen flagpole. You dasn't dismiss a double dog dare and risk that shadow of humiliation. Always with you, starting upon awakening. He backed down from the DDD. They're still on. Tread lightly. Two nights ago the male aussie puppy chewed a strand. They popped and all went out and he shrieked, ran to the house. This was an act of dog. I could live with it. I replaced that strand. There was no mystery to it. I didn't have to be smarter than the lights this time. I can handle this, I felt. And the pup had a moment of training, to boot. I just looked outside. They're still on. I'll look once before bedtime. Shh.